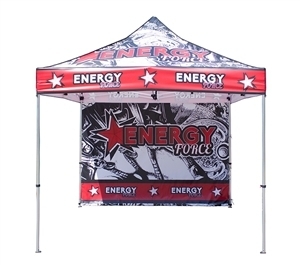 We offer many varieties of outdoor event tents, road-side flags, outdoor signage, and other functional and attractive products that your next outdoor event needs. Mix and match to compose an efficient assortment of products for your outdoor (or indoor) display. 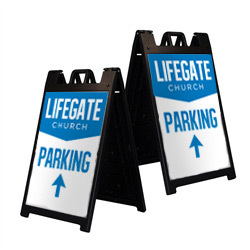 Combine an event tent and tent half wall with a Medium Feather flag, and Deluxe Sidewalk Sign to draw people in, while offering them refuge from the hot sun. Most of our products are completely weather-proof, meaning they will not fade as much with long sun exposure, won't melt or deteriorate if wet, and will stand firm in blustery weather. 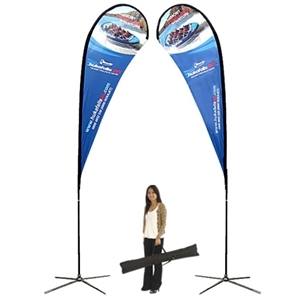 We offer a selection of additional tools to ground your flags and tents in windy weather. Need to brainstorm further grounding solutions? We're here to help you through any questions, and to ensure your display looks good and doesn't blow away!